Planning such a long trip is problematic. You are likely going to get distracted along the way and the Greyhound website isn’t great for doing this. It’s better to be prepared to linger when you can’t help it, and rush when you have to. Get in the habit of checking the information at the bus terminal when you arrive in a destination, and check with a station attendant as to the best way to get to the next destination so you can plan better how long to spend in each place. Listen to your gate number at transfers! There’s nothing worse than hopping off at night, waiting for 45 minutes, then realizing you are in the wrong queue and being the last to board the bus ending up with the crappiest seat going. It’s good to get to the bus terminal early as you’re not guaranteed a seat, even with a ticket, and therefore may have to wait for the next departure. The established etiquette is to reserve your place in the queue with your bag, so plonk it down as soon as you get there so that you can get on the bus quickly and grab a decent seat. Don’t sit near the AC! Sometimes, the buses can be like sitting in an ice block. The AC vents are along the upper baggage shelf. Avoid these like the plague and take a jumper, even if you don’t need one outside. Travel during the day. The first couple of trips I took were during the night, mainly to save on accommodation costs. However, this was when there tended to be the dodgier passengers on board, and some people may find hanging around bus terminals at night intimidating. Touching down in New York City started the trip like a dream, but we ended up paying for this in the second half of the journey! With so much to do, from Times Square, to Wall Street and the new construction at Ground Zero, we ended up spending five days in New York. A few tips would be to hire bikes to cycle round Central Park so that you can appreciate its size and to go up the Rockefeller Center instead of the Empire State Building, as this offers views of downtown NY and Central Park, whilst also allowing you to appreciate the beauty of the Empire State Building itself. All aboard! Leaving NYC for DC. New York to Washington DC was possibly the easiest leg of the trip. At only roughly four hours, and on the express model of Greyhound which has more legroom and free Wi-Fi, I arrived with plenty of energy to explore the city. tourist sites, or hire a Segway if you’re lazy! From the Capitol building, you can see the Washington Monument all the way down to the Lincoln Memorial. 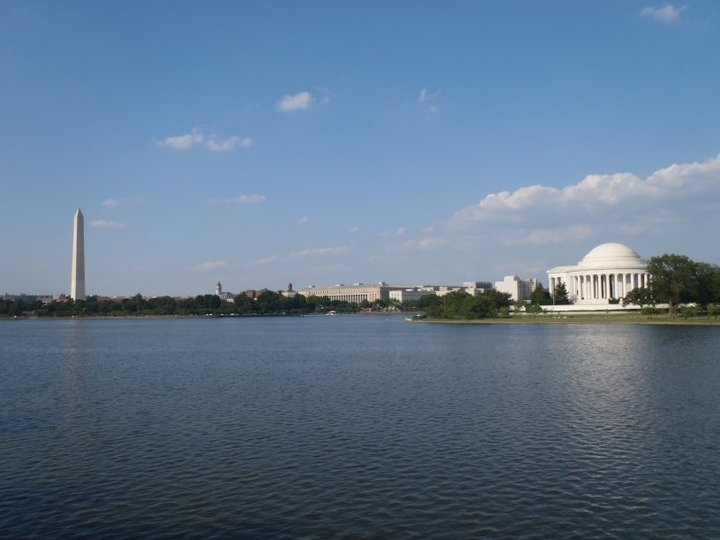 Down on the river front, you can walk round to the Franklin D. Roosevelt Memorial and the George Washington Memorial, whilst stopping off at the Tidal Basin with views of the best parts of Washington DC. Nice view across the Tidal Basin in DC. Savannah was one of the stops aimed at breaking up the journey from one location (DC) to another (Miami). However, it was one of the best surprises along the way, with an abundance of town squares in the Historical District overflowing with trees covered in Spanish moss, a great Southern vibe and some lively bars, including along River Street. Traveling from Washington DC to Savannah and then Savannah to Miami were two of the worst journeys overall. This was mainly due to deciding to complete them overnight, with sleep interrupted by regular and lengthy stop offs and some boisterous passengers. Again, the warm tropical climate in Miami, lively South Beach and range of attractions on offer, including a hair raising air boat ride through the “River of Grass” in the alligator park, resulted in a stay of four days, which added to the rush across the Southern States. In order to get to our next stop of New Orleans, an overnight journey to Tallahassee was required, which was over 12 hours long. Having taken so long to get to Tallahassee, I was keen to push on and left after one night heading towards New Orleans. Staying just off Canal Street, with the historic street car running down toward the waterfront, it was incredibly easy to get to the French Quarter. The French Quarter, with the famous Bourbon Street, is an area alive and colorful, especially at nighttime. Bands play in the street to crowds enjoying a (legal) alcoholic beverage outside, with popular drinks being the Hurricane or the Grenade. Don’t walk down here if you are not prepared for a scene of harmless debauchery, but be encouraged by the safe atmosphere and lively music scene. Following two nights in New Orleans, I moved on by day to Austin, and instantly enjoyed the vastly improved views offered by traveling during the day. 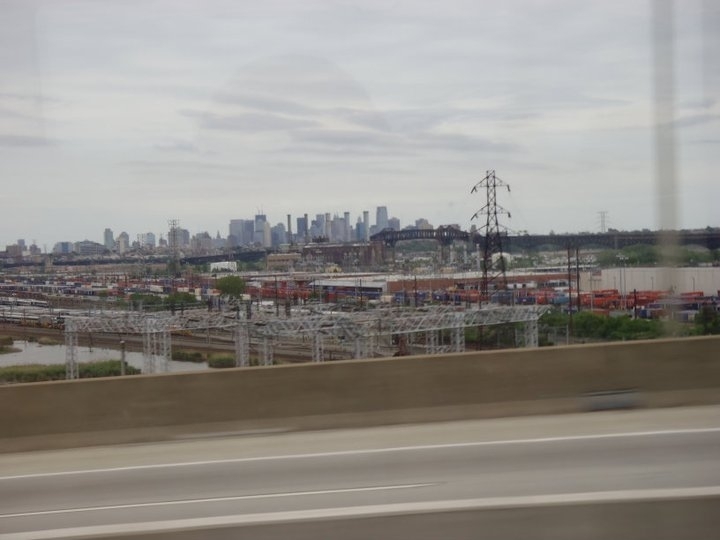 Passing through Houston was visually stunning, as the highway sweeps majestically into the city around the skyscrapers, and is a good example of the fleeting tours of places as you drive from one destination to another. Austin is a creative, expressive city that you wouldn’t expect in Texas, with a calm and serene river passing through as well as the freezing cold yet refreshing Barton Springs. The large student population gives the city much of its beating heart and energy, and the bars along 6th Street deliver the entertainment without fail, including some cool rooftops and terraces with dance floors on them. The rest of the trip across the South was a crazy rush, as having spent too long on the East Coast and wanting to spend enough time on the West Coast I needed to make up ground, which is not an easy task when you’re in the middle of the expansive state of Texas! This is where traveling during the day came into its own though, as flying past cattle ranches and climbing barren mountains turned the trip from a journey to a tour. With enough time to spend a day in El Paso, I traveled just a little farther north to New Mexico to visit White Sands National Monument, which predictably delivered endless pure bleached sand, scorching temperatures and some dune surfing! When making a long trip like this, that in all honesty ends up being a bit tight for time, taking a hit and rushing through certain areas can reap rewards when you build up a bit of spare time. This was how it happened on the West Coast, as pushing through the South turned out to be a great idea. It wasn’t just the Anchorman movie that made me want to visit San Diego, but that would have been enough! There’s a pretty cool district called the Gaslamp Quarter which has a good combination of lively bars and some flashy roof top clubs that we managed to get into by tagging along with the hostel group we were staying with. and full of all the big crowd pleasers. 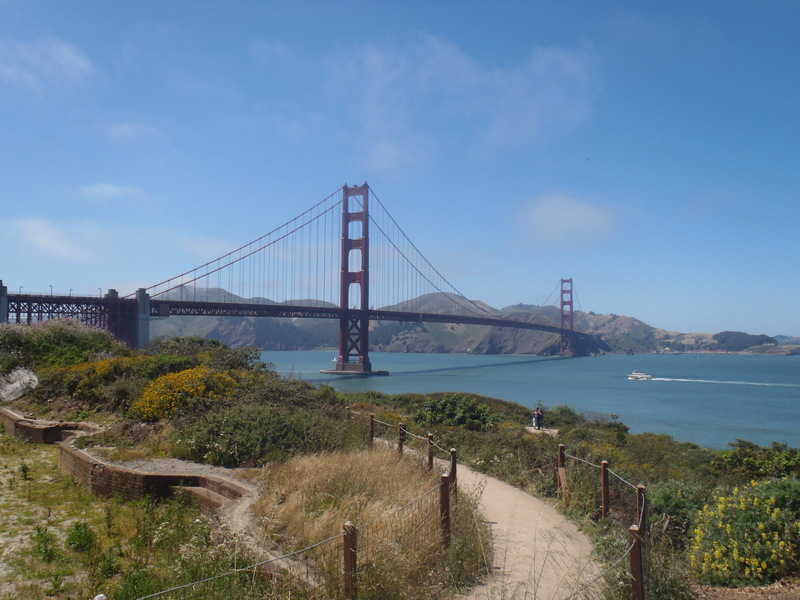 Venturing up the Californian coast showed just how different the West Coast is to the East, and having been through the South, the trip was a great eye-opener to the diversity of the US. LA was its own chauvinistic enclave, with the Hollywood walk of fame being tackier than expected, but still a must see and it fills the obligatory travel photos if you haven’t really bothered to snap much. California also has a good range of small, characteristic towns, such as Santa Cruz which still has a lively boardwalk, some visiting sea lions and good beaches to learn to surf on. Having sprinted across the final Southern states I had time to spend three or four days in each location, which is a good way to take the rush out of such a long road trip. San Francisco was a worthy end destination to cap it all off. 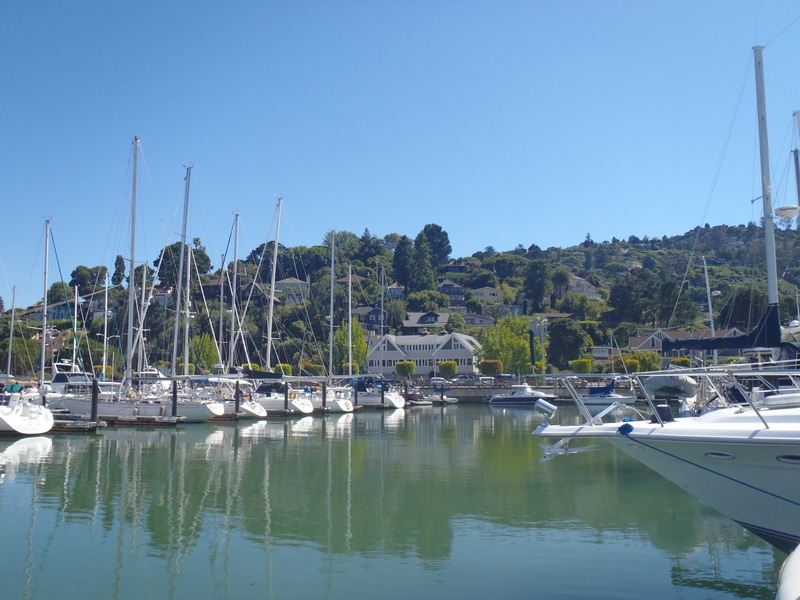 A cheap way to explore the city is to hire a bike which gets you along Fisherman’s Wharf with views of Alcatraz, across the mighty Golden Gate Bridge and into the town of Sausalito, with a cool little marina to stroll around.